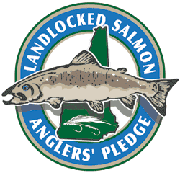 By pledging to be dedicated stewards, landlocked salmon anglers can make a critical difference in sustaining this valuable fishery. 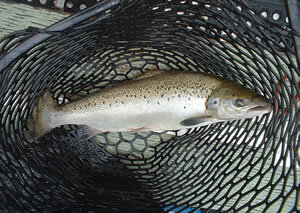 Demonstrate a commitment to conserving New Hampshire’s landlocked salmon resources. Acquire and demonstrate skill in using best practices that minimize impacts to this fishery. Take the time to observe this valuable resource and reflect on its condition. Hold themselves accountable and act in an informed, responsible manner. 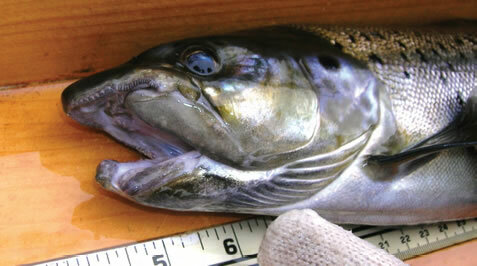 Pursue opportunities to educate others about landlocked salmon resource issues. Recognize that resource issues generate differing points of view; while they may not agree with someone else’s perspective, they respect their right to express it. Catch and release fishing is a valuable tool that can lead to more and bigger fish in the fishery, but just because a fish swims away doesn’t mean that it lives to be caught another day. If you are releasing landlocked salmon, use the following practices to increase the chances that the fish you release is unharmed. The time it takes to remove hooks affects survival rates. Use hooks you can easily remove from the fish. Have your hook removing tools easily accessible and ready for quick use. NEVER shake a fish off the hook. NEVER unhook a fish suspended in the air. NEVER sharply pull hooks out while the fish is moving and twisting. Survival increases when fish are not fought to exhaustion. If trolling, stop the boat immediately and play the fish quickly to the net. During the summer months, when surface water temperatures are high, reduce fight time as much as possible. Have a plan on how to handle the fish before it’s boated to minimize handling time. Use rubber or other “fish friendly” landing nets. If you have to handle the fish, make sure your hands are wet. Minimize the time the fish is out of the water, less than 30 seconds whenever possible. Never touch the gills as this causes damage and impairs the fish’s ability to breathe. Has been fought to exhaustion. Has been handled excessively after it was landed. Has sustained a debilitating injury from a previous hook-up. On days when you experience high catch rates, particularly when water surface temperatures are above 70 degrees F, consider limiting your fishing time/trip duration. This is difficult to ask of anglers who have a lot invested in their pursuit of these magnificent fish, but this limited fishery is not capable of sustaining high levels of catch and release fishing during the warmest months of the year. The bottom line: Landlocked salmon are a limited fishery and increasing fishing pressure combined with the use of advanced fishing technology has profound impacts on this unique resource. Pledge to be a dedicated steward by acquiring and demonstrating skill in using best practices that minimize your impacts to this valuable fishery. Fisheries management in New Hampshire is funded by the Federal Aid in Sport Fish Restoration Program, a user-pay, user-benefit program. Take the pledge to be a dedicated steward and assure the rich heritage of New Hampshire’s landlocked salmon resources continue for future generations. Use a rubber net to minimize injury when landing a fish.